Every summer BBQ deserves a good potato salad, don’t you agree? This Creole potato salad hails from Louisiana where people are never too far from their Tony Chachere’s or Zatarain’s. The distinguishing feature of creole potato salad is “creole mustard”, which has a unique spicy taste with chiles, molasses, and herbs. I was able to find a jar at our local Raley’s grocery store here in Sacramento, so I’m guessing that it’s not too hard to find in other parts of the country. This is a great make-ahead salad, as extra time chilling in the refrigerator helps the flavors sink into the potatoes. 1 Boil the potatoes: Place potatoes in a large pot, cover with cold water by an inch. (If you haven't already hard boiled the eggs, you can boil the eggs with the potatoes.) Bring to a boil and add about a teaspoon of salt. Lower the heat to a simmer and cover. Cook until the potatoes are fork tender, about 10 minutes. Drain in a colander. 2 Make the dressing: While you are boiling the potatoes, mix the sugar, vinegar, mayonnaise and mustard in with the celery, peppers and onion in a large bowl. 3 Mix warm potatoes with dressing: While the potatoes are still warm, gently mix them in with the dressing. Stirring them in while warm will allow the potatoes to soak in the seasonings better. 4 Add hard boiled eggs: Gently fold the chopped hard boiled eggs into the potato mixture until well combined. Taste the potato salad and add salt to taste. 5 Chill: Put the salad in the fridge for at least an hour before serving. Serve chilled, garnished with paprika or Cajun seasoning. Hello! All photos and content are copyright protected. Please do not use our photos without prior written permission. If you wish to republish this recipe, please rewrite the recipe in your own unique words and link back to Creole Potato Salad on Simply Recipes. Thank you! What a delightful way to spruce up an original. As I can’t eat green peppers, I’m curious if there is another ingredient I may add that would serve a suitable substitution? Thanks! The Creole potato salad recipe sounds great because I really dislike common, everyday potato salad. I noticed the recipe called for Creole mustard, which I have never seen in my regular grocery store, so I did a search and found several sites that describe how to make ½ cup of Creole mustard with 8 Tbs dijon mustard, ½ tsp Worcestershire sauce and a couple of shakes from the Tabasco bottle, but what I also found was a recipe for Cajun mustard that sounded like it would make for a much more interesting potato salad. I thought this would add a little more spice to the potato salad, and I just love spice! let stand 15 minutes. Stir in the remaining ingredients and mix thoroughly. When I saw the title, I thought you might have attended a real crawfish, shrimp or crab boil anywhere here along the Gulf Coast. As a few others have mentioned, when they do a boil along the coast (not just in Louisiana), they also boil corn on the cob, onions, lemons, sausage, potatoes, & most recently I’ve seen mushrooms thrown in the crawfish pot (a really, really big pot that is about twice the size of my bathtub). The leftover boiled potatoes make an excellent salad which need little more than mayonaisse, eggs (optional), celery (optional). It’s delicious! But, alas, no creole mustard; it would interfere with the (crab) boil seasoning. I made this today for my Memorial Day cookout —- yum. I added a hefty dose of creole seasoning to the mayo/creole mustard…..my family likes spicy. Very good —- a keeper recipe. What a lovely recipe! I also added some chopped radish for an extra crunch, some extra Cajun seasoning and chopped fresh coriander. Loved it! I’ve been making my potato salad in a similar way for years, and have never seen a recipe for it! Actually, I mix Zatarains with Italian dressing (I really don’t love mayo, hence this combination), and since my kids think hard boiled egg yolks look gross, I smish those up into the dressing as well. In addition to the veggies you listed, I typically shred a few carrots, and throw in whatever else is taking up space in the veggie drawer — blanched broccoli, perhaps a little grated onion, or green onion tops. Mmm. I haven’t made this since last summer — might have to make some today! I made this today for a bbq tonight and I’m afraid I’ll eat it all before dinner! 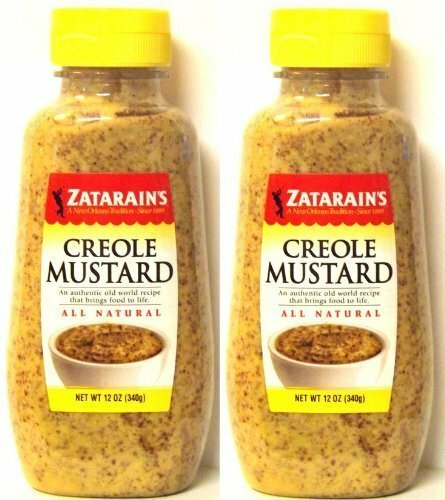 It is super tangy and the Zatarain’s mustard gives the salad a great “spicy” look-lots of little flecks of color. I used red peppers instead of green and added green onions. Delicious! Anna, Tony Chachere’s Original Creole Seasoning is MSG-free and very good (note to folks outside of Louisiana: it’s pronounced “SASH-a-reez” — I had to learn that when I moved here!). You can order it online at http://www.tonychachere.com/ . Another great MSG-free spice blend that we have fallen in love with is hand-mixed at Kitchen Witch Cookbooks on Toulouse Street in the French Quarter. Their Kitchen Witch all-purpose Creole spice blend goes on everything and tastes delicious. Go to http://www.kwcookbooks.com/ and click on “Other Offerings” for more info — they ship countrywide. They also ship New Orleans tap water — “our impure, adulterated local Mississippi River water” — around the nation to add to your gumbos, etoufees, and crawfish boils for real New Orleans flavor! OK, I’ll have to try this, but I have to say that your Dad’s potato salad has won raves every time I’ve made it. How does that fella stay so fit?